There’s a humor amidst the violence and mayhem of Fight Club that makes the picture especially menacing. It is a complete original with all the makings of a great movie. Currently at number eleven on the IMDb Top 250, the 1999 film is undoubtedly considered a classic because it is unique and it seems to have something to say about the American Dream. “The things you own end up owning you,” says Tyler Durden. It’s a wise statement, but it could be easily dismissed considering that Tyler becomes the movie’s villain. The beginning of Fight Club is fresh and exciting; it promises to be a movie that is relevant to us. However, Fincher’s movie settles for less and sacrifices a final statement for an unnecessary plot twist. 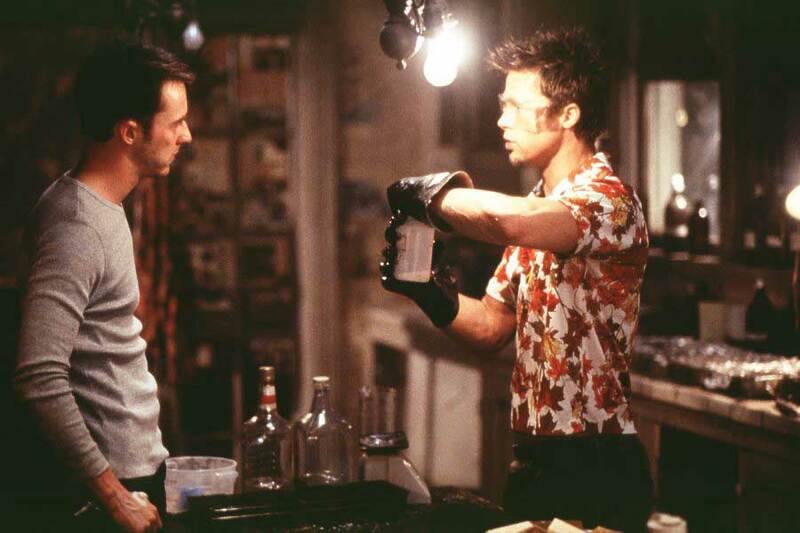 The performances of Brad Pitt and Edward Norton are exactly as they should be. Pitt embodies the character of Durden, one of his best-known roles, and plays it with lots of quirk. Norton gives the performance of a star and I never found myself thinking that he was acting. The soundtrack and the style of editing also gives the movie an unrealistic amount of energy. For these and more reasons, I was captivated by Fincher’s film almost the whole way through. Almost. But the final act of the film is too clever for its own good. I absolutely loved the direction this story was heading until it actually got there. Staying spoiler-free, I’ll just say that the twist is pretty shocking. The entire film seems to be leading up to a certain ending that never even happens. I don’t usually feel this way with movies like this, but I felt like I’d been cheated out of something very special and that the story settled for a lot less than it should have. Apart from the fact that I was a little turned away in the end, I enjoyed the majority of Fight Club. Its originality and ambition stands out among most of today’s Hollywood movies. Who knows? If the screenwriter had strayed more from the source material, I might have found this to be a masterpiece. Instead, I simply found it to be excellent entertainment. Fight Club is a good addition to the David Fincher filmography, but Se7en and The Social Network are his true masterworks. Fight Club’s my favorite work by Fincher after The Social Network. I had the ending spoiled to me (sadly), but that didn’t stop me from enjoying it. Nice review. It’s possible that I might have liked the movie better if I already knew how it was going to end. Simply because I didn’t enjoy being tricked. It’s strange, I loved the trickery at the end of movies like The Prestige and Shutter Island, but this time, it was a little bit of a let down to me. It’s still a very good movie though. Thanks! Speaking of which, I had the ending of Shutter Island ruined to me too!